What’s happening in marichyasana D? In the primary series of Ashtanga vinyasa yoga, the postures increase in complexity as we go through the sequence, until they peak in a series of five postures. I sometimes refer to this group of postures as “the train wreck”: marichyasana D, bhujapidasana, kurmasana, supta kurmasana, and garbha pindasana. Beginning with marichyasana D, these postures can often seem mysterious and unapproachable to students. Students frequently report feeling “stuck” in these postures, and are at a loss as to how to work in a way that these challenging postures continue to evolve. Some students feel like they don’t even know where to start working with these postures! 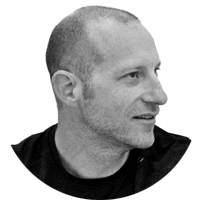 These are often the postures that garner the most questions at anatomy workshops when the audience is primarily composed of Ashtangis. It’s true that this series of postures is challenging! If we haven’t spent sufficient time preparing the body for these postures, by working deeply in the postures that come before these, then it really can look and feel a bit like a train wreck. 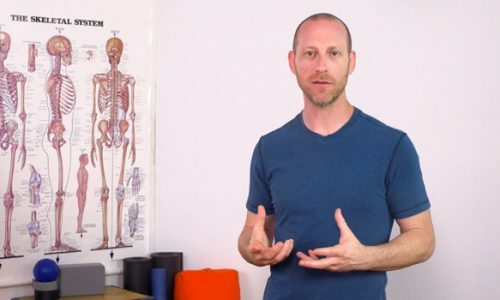 In the next series of asana posts, I’m going to break down these postures from an anatomical perspective. I’m also going to shed some light on the common struggles in these postures. I’ll help you take a look backwards in the primary series to find the patterns and intentions in preceding postures that inform how accessible the postures of the train wreck are, when you get there. We’ll start our exploration with marichyasana D.
So, anatomically, what’s happening in this pose? A lot! If the left leg is the one in half lotus position, then the left hip is deeply externally rotated to allow the foot to, ideally, sit in the hip crease. The right hip and knee are flexed deeply to allow the leg to come toward the body. The right hip is also adducted to bring the knee toward the left shoulder before reaching for the binding. Both shoulders are deeply internally rotating in order to reach around the right knee and the torso to bring the hands together for the bind. Finally, we are twisting deeply through the whole spine. There is a lot going on in marichyasana D, so unless you are naturally very bendy, you are probably going to have to deconstruct it and work on each aspect of the posture. Let’s start with what is probably the most obviously troublesome piece, the half-lotus. A comfortable half-lotus requires open hips which allow us to place the knee and ankle in an optimal position in the hip crease of the opposite leg. Any restriction at the hip joint can be felt at multiple points below the hip in the chain of joints. Tension in the hip joint, which is reducing the external rotation needed for half-lotus, can put pressure into the knee joint in a way that can cause pain and be injurious. Tension in the hip joint can also influence the ankle below. If the hips aren’t open enough to place the ankle in the ideal spot, you might experience sickling of the ankle — that awkward feeling that you’re bending the foot in a way that you shouldn’t be. All of this points to the importance of preparing the hip joints for this kind of external rotation before trying to assemble the pieces of marichyasana D.
So, let’s give some thought then to how we might prepare the hips for a comfortable half-lotus in marichyasana D. If we think through the primary series, we might notice that we actually began opening the tissues around the hip joints all the way back in our standing postures. Remember triangle, revolved triangle, side angle, and revolved side angle? We began stretching the muscles around the hips in these postures. We met our first half-lotus in primary series in ardha baddha padmottanasana (standing half-bound lotus). If we spent time exploring that posture, it will be reflected in other postures that incorporate a half-lotus. After we make our way to the floor in the primary series, we meet seated half-bound lotus, then three variations of janu sirsasana. Finally we meet half-lotus again in marichyasana B. If we have really been doing all of these postures consistently, then we should see that the hips are at least beginning to open. If you never approach the half-lotus, it is unlikely to change. That said, there is nothing to be gained by forcing the body either. So, rather than just tucking the lotus leg underneath if you are struggling with half-lotus, consider some intermediate stages that will direct some stretch into those tight hips. The first option you might work with is placing the foot of the lotus leg part way up the thigh of the other leg and just breathing there. If this is your modification, then you may still need your hands on the floor for balance. In the next stage, maybe you can bring your lotus foot pretty close to the hip crease. At that point you can probably maintain enough balance in the posture to pick your hands up off the floor and use both hands to hold the knee of the non-lotus leg or wrap one arm behind you. Keep checking in to what you’re feeling in your body. You are aiming to put pressure and stretch into the hips, not the knees. If you’re feeling pressure in the knees, back out and adjust the position of the lotus leg until you’re feeling the stretch in the hips. If we are practicing the primary series, then marichyasana D is not the first place that we have met the aspect of binding. As with the half-lotus aspect of the pose, the first place we met binding was in standing half-bound lotus. We should now have an idea how that action happens. We learned to fold forward toward the thing (big toe in that case) that we wanted to bind. But, if we have very long arms, and/or a very thin torso, we still may have been able to coast in this aspect of our practice so far. Marichyasana D, however, requires a deep bind and it often requires a little more intention and a little more technique to access it. 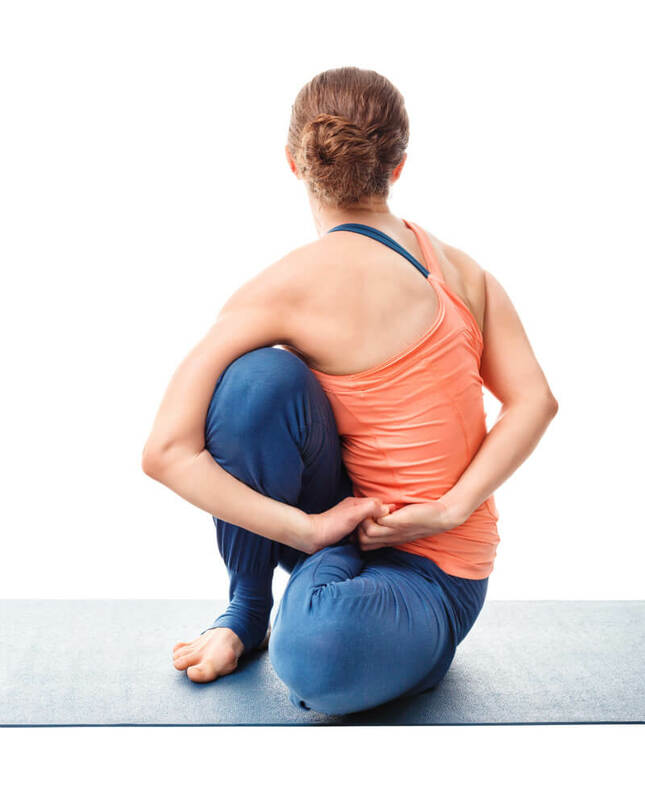 The first part of binding marichyasana D is a technique piece that is often missing when students can access the half-lotus comfortably, but still feel like they are struggling to bind this pose. What often happens is that the student acquires a habit of leaning back on the back hand. This is a stage of the posture that might have been necessary at first, perhaps while they were still working with the hips and the half-lotus aspect wasn’t accessible yet. But now that we’re at this stage of the pose, the hand placement needs to change. We need to go forward with the whole body toward the knee that we want to bind. I encourage students to move through a few steps to explore how much of the bind is accessible. Let’s walk through the steps as if the left knee was in half-lotus. If your hands aren’t meeting in the bind yet, you can hold a towel, a strap, or hold your own foot. This will help you work on the intention of the bind, while you are waiting for your shoulders and hips to be open enough to allow you to bind the hands. If you have a teacher to assist, they can use their fingers to bring each of your hands toward one another, creating the feeling of the bind. The second thing that is necessary for binding marichyasana D is sufficient openness in the shoulders to allow the arms to reach. We have three other marichyasanas before we come to “D”. Each one challenges the bind in a slightly different way. If we have been working the binding aspect in each of the preceding poses, then we will have been working toward increasing the openness through the shoulders which is necessary for binding. It’s common for it to take some time for all the pieces of this posture to come together. If this posture is a challenge for a student in both the half-lotus and binding aspects, and I see that they are really working on these themes in the rest of their practice, then I will often have them do this pose twice. I’ll have them do the pose once with a leg in half-lotus, while propping themselves up and reaching both hands toward the binding knee. I’ll then have them do the pose a second time with the leg tucked underneath while working the binding aspect. There is far more happening in marichyasana D than I can cover in one article. 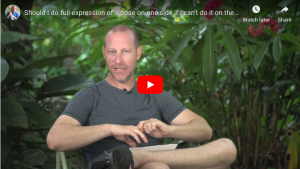 So, while I shared a few ways that you can explore and evolve your marichyasana D, consider that there are many ways to understand and work on the various pieces that come together to create the full expression of this pose. If you are struggling with this posture, maybe choose one piece to work on for awhile that seems most relevant to you and see where it goes. I really enjoyed this article: the photos of the modifications are great! 1) How much should we allow the hip to come off the floor? 2) How much should we let that same knee adduct? Would it be acceptable to let that knee go past the midline of the body to facilitate the bind? And then would that foot have to come out to the side a bit more as a result? These are a few things I’ve thought about with this pose. Thank you for your time! I do have a question though. 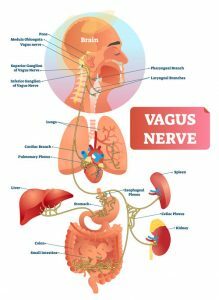 I have been experiencing ankle pain from sickling in the marichyasanas. I can comfortably get my ankle to the hip crease but once I bend the other knee and bring that leg up, my foot sickles and sickles even worse when I lean forward. My teacher has said to flex the foot and dorsi flex the big toe, which does help in all other half lotuses, but seems impossible to really do in marichyasana. I have suspected and now know for sure that the problem stems from my hip. Should I back off and work more on the intermediary hip openers? I’ve intuitively started adding things like half and double pigeon to my practice.